Listening to which I come to peace my love And the destination is unknown….. And it was like that….. the heart was full of pleasant emotions, as the horses and owners walked in the moonlit nights at peace with themselves…. in harmony….. toward a destination that was an integral part of life for a horse and owner in this part of the mountains. Saare haseen najare Sapnon mein kho gaye Sar rakh ke aasmaan pe Parvat bhi so gaye All the beautiful sights around Are lost in their world of dreams With their heads cushioned in the sky Even the mountains are sleeping And it was like that……….. the world was a beautiful play of moonlight and shadows – a world in black and white – the snow covered mountain tops a very grey against the night. The world indeed seemed to be sleeping, as we walked along the deserted highway through deodar forests silhouetted against the moonlit night. The only sound was the hoofs of horses on the road, and the steady river flowing along. Aise mein chal raha hun Pedo ki chaao mein Jaise koi sitaraa Badal ke gaon mein And thus I am walking In the shadows of the trees Like some star In a village of clouds hmmmm….. drifting along the road…. all night the men, the horses and the night and the journey through the evergreen forests Thodi si raat beeti Thodi si reh gayi Khamosh rutu na jaane Kya baat keh gayi Some of the night has passed Some of it remains The silent season I know not What it has said And the nights….. yeah they passed bit by bit, withthe last kilometer never seeming to end. Its surprising how after walking for 30 km, the last half kilometer seems impossible. It happened everynight, as weary caravans came to open grounds to set camp for the day. Until the night…….. 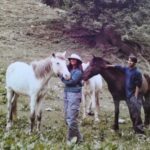 It is a time of my life that was so beautiful, that for all my life, a part of me will remain the simple horsewoman with her simple life and simple cares – away from the complex urban life – far away in the mountains.